Inspired by Papa Murphy’s Cinnamon Wheel, this dessert pizza has all of the goodness of a cinnamon roll! A buttery brown sugar cinnamon spread on top of a quick and easy pizza dough, and drizzled with a cream cheese glaze! 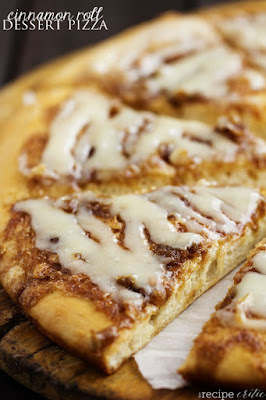 Inspired by Papa Murphy's Cinnamon Wheel, this dessert pizza has all of the goodness of a cinnamon roll! A buttery brown sugar cinnamon spread on top of a quick and easy pizza dough, and drizzled with a cream cheese glaze! Preheat oven to 400 degrees. Spray a 12 inch pizza sheet lightly with cooking spray. Set aside. Mix warm water, sugar and yeast together. Let that sit for 5 minutes. Add flour and salt to the water, sugar, and yeast. Mix this until smooth and let it raise for 10 minutes. I used my kitchenaid mixer with the dough hook and it was so easy and worked great! Roll the dough into a 12 inch circle and place on top of pizza pan. If you want the dough to be thinner, divide it in half and use the other half for pizza. Once it is in the pizza pan let it rest for 10 minutes. To make the spread: In a small bowl combine butter, brown sugar, oats, and cinnamon. Spread thinly on top of the pizza crust. Sprinkle with additional brown sugar if desired. Bake for 12-15 minutes or until the edges are light brown. To make the glaze: Beat together butter and cream cheese. Add powdered sugar and vanilla until combined. If it is thick, put it in the microwave to soften it up. Drizzle on top of the pizza. 0 Response to "CINNAMON ROLL DESSERT PIZZA"